A smooth, firm ivory texture with a full, goaty flavour. Situated in the north-east department of the Cher, Chavignol is a hamlet near the town of Sancerre, which is famous for its wine production. 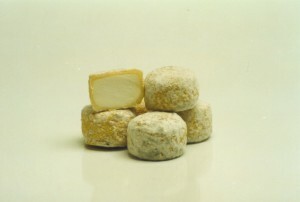 The Crottin de Chavignol was first made as a snack to be eaten during the grape harvest. It took its name from the small clay oil lamp from the Sancerrois but was soon nicknamed 'horse droppings'. This was because crottin in French means 'dung' and because of the cheese's resemblance to horse dung when mature. 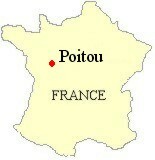 The Crottin de Chavignol was granted its AOC status in 1976. When fresh, a Crottin de Chavignol weighs 140g, but during the first two weeks of maturation it dries to 110g. The rind develops a white bloom with a bluish hue and can be eaten at this young stage. Its texture is moist and it has a light goaty flavour. After a further three weeks of ripening the small cheese shrinks to 70 grammes. It becomes harder and drier, and the flavour becomes fuller and the smell stronger. It is at this stage that we sell the Crottin de Chavignol at The Teddington Cheese. The cheese can be matured for a further three months during which time it shrinks to 40g. The rind becomes pitted and brown, and sometimes black. The flavour is intense and the very hard rind can only be removed by grating. Sixteen million Crottin de Chavignol are made every year, the majority in large creameries. The farmhouse Crottins we sell at The Teddington Cheese are made using unpasteurised goats' milk. They represent a very small proportion of the total production and their flavour is always superb. These small cheeses are excellent throughout the year although the very best, as with most goats' milk cheeses, are made from spring to autumn. Crottin de Chavignol are excellent as part of a cheeseboard and also fabulous when grilled and served warm on a salad as a starter. Alternatively, enjoy on their own with a glass of Sancerre de Chavignol wine. Each Crottin measures 4cm in diameter, is 3cm tall, weighs 75 grammes and has a fat content of 45%.